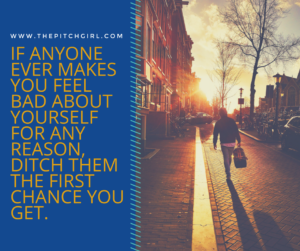 In the immortal words of country singing legend, Kenny Rogers, “You’ve got to know when to hold ‘em, know when to fold ‘em, know when to walk away, know when to run.” The same can be said for pitching. I’ve been attending networking events for many years now and I’ve learned a couple of things that may be useful. It’s helpful if you’re not a natural at networking. I’m going to give you 4 tips for making new quality connections while avoiding networking users. Don’t talk to the hand. I explained that I teach people to pitch themselves in 15 seconds.” That was all I said. She immediately raised her hand to me, as if to say, “STOP!” and announced that she had worked for Con-Edison for 25 years and had no intention of leaving. I told her, gently, “You did ask me what I do for a living and I am telling you now. I am making no attempt to sell you.” This seemed to calm her down and we continued our, now very awkward, conversation. The lesson? I learned that if someone is THAT resistant, it’s best to move on and talk to someone else—as soon as possible. Ditch this situation as soon as you can without being rude. Don’t take sh*t, from anyone, EVER. This took me a long time to learn. There’s a reason why networking gets a bad rap and why so many people despise it. It’s because sometimes you meet people that just aren’t very nice. Here’s what you do, and I’ve tried it myself and it works like a charm. Let’s say someone is giving you the hard sell on their product or service. Or, worse yet, trying to recruit you to be part of their latest MLM scam! You owe it to yourself not to give them one second more of your precious time than is absolutely necessary. Once, a woman who was dressed in what looked to be a $15,000 custom LEATHER suit, made a beeline over to meet me at a networking event. She was a personal stylist, no surprise. I must admit that this observation did sting a little bit. Mainly because I was SLEEPING ON MY BEST FRIEND’S COUCH at the time. Also, my former business partner/boyfriend had left me penniless. I was trying to rebuild my life and my business from the smoldering ashes. But I digress. The point is this. I was kind of shocked when she said this to me and I stumbled around for the right words. I saw the caterer brought out a new tray of food, so I cut her off mid-sentence. “Great to meet you,” I said, ” I don’t want to miss the spring rolls, so I’m off to catch that waiter.” I was walking away from her as I was saying this. She looked stunned. Maybe her awful, insensitive pitch worked on other women? I can’t say, but I can tell you that the veggie spring rolls were too die for! If anyone EVER makes you feel bad about yourself for any reason, ditch them the first chance you get. You don’t need that negative juju as you build a big, fabulous life and business! If you’ve read this far, (thank you!) then you are ready for some GOOD, positive Pitch stories and ideas. Here you go. Networking with the Outcasts, Geeks, and Wallflowers. Decide to be the brave champion of networking, even if you don’t always feel like it. Talk to people whom others might describe as nerds. Walk right up to one of the people standing on the sidelines, smile and make some small talk about how bad the cheap red wine at the event is. Or how it was a slog to get to the event. Break the ice. You don’t need to start off with, “So, what do you do?” the question that most people seem to have trouble answering. Start off with something EASY and build from there. If they are nervous tell a quick story, so they feel more comfortable. Even the best, most confident networking pros sucked at some point. That’s the truth. And they still have bad days today where they blow an opportunity or stick their foot in their mouth. I was at a mastermind dinner recently with some very heavy hitters. As we went around the room to introduce ourselves, one young woman said, “Wow, I’m nervous, is anyone else nervous?” EVERYONE paused and took a breath and she continued. She was honest enough to say what other people were thinking and the group respected her for it. She was the first person I reached out to after the event. If you can be the brave person who walks up to someone who is standing alone, you are halfway to winning the long-term game of relationship building. There is genius in the shadows, you need to look for it. Pitch in and make networking more fun and less painful for everyone, including you. Pitch for WHATEVER it is that you really WISH for. People think of pitching when it comes to selling and business. 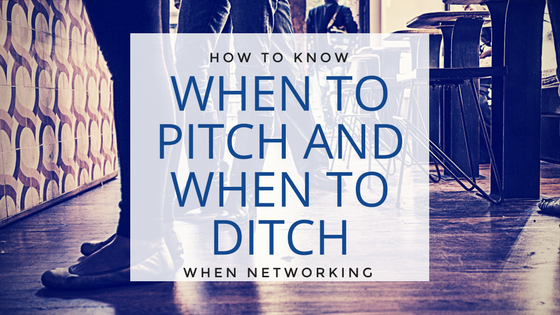 They think of pitching as introducing themselves at networking events. As far as I’m concerned, a pitch can be used for almost ANY kind of REQUEST. 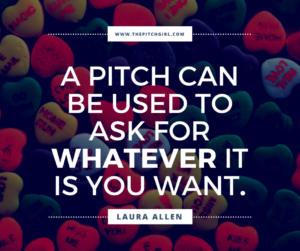 A pitch can be used to ask for WHATEVER it is you want. Whether that’s a new boyfriend or girlfriend. It could be a new apartment, a donation for your favorite non-profit or all the above. Yes, it can be used to attract the right business partner or copywriter or web designer. The key is to get CLEAR on what you want for your business and life. Then work on getting up the courage to start asking for it, confidently. No, it’s not always easy and now, and no, WISHING ALONE is not enough. Look for QUALITY events and conferences that will attract the types of people that you want to connect with. The bottom line- learn to pitch for whatever it is you wish to achieve. Though don’t forget to spend the majority of your time HELPING OTHERS TO GET WHATEVER IT IS THEY WISH FOR. That’s the way the most successful people do it. It’s slow and it takes time and there are bumps along the way. Sooner or later, you’ll be sitting pretty at that proverbial poker table, when the dealin’s done.